Today I’m reminiscing on a dinner I had last weekend, but this meal could also be used for breakfast and brunch. The dish is shrimp and grits. It sounds simple because it is. I won’t go into a detailed recipe, because I’ve learned there are many variations to this classic dish. When cooking the grits we made them very rich, using half and half, cheese, butter, and seasoning occasionally with salt and pepper. Fresh chopped parsley was added for a little hint of color. The shrimp were lightly seasoned, sautéed, and then added to the grits which equaled a big pot of deliciousness! My dad cooked white bass fish as we had extra, and we enjoyed Italian moscato which paired great with the seafood. 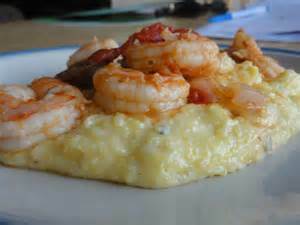 What’s your variation of shrimp and grits? And if you haven’t tried it, what are you waiting for?! For a brief history of this iconic pairing click here!